Live in California? The divorcee who lives in this luxury villa (six bedrooms, six baths; sleeps 10) in the Chianti region of Tuscany between Florence and Siena is willing to swap houses with you for free via www.homeexchange.com. Trading spaces isn't just a show on basic cable anymore. It's a way to live life like a local in Italy absolutely for free—so long as you let the local borrow your life (and home) in return. This kind of vacation home exchange process is called home swapping ("scambio casa" in Italian)—and with the 2006 movie "The Holiday," it's gone Hollywood. 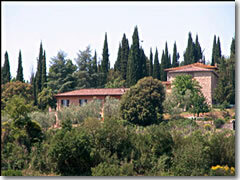 You want to see Florence; a Florentine wants to stay in your hometown...why not just trade homes for a week or two? That's the simple idea behind home swapping. You get to stay for free in a genuine home or apartment abroad, and all you have to do to get it is be willing to let someone else shack up in your house while you're gone. It's just like Kate Winslet and Cameron Diaz in "The Holiday." You have to agree to take this vacation at the same time. You're opening your home to a stranger, and you won't even be around to keep an eye on the family silver. Folks who take advantage of this vacation method regularly just get used to browsing for places that interest them—not setting their hearts on just one spot, then hoping to find a fellow swapper in it inclined to trade—and being flexible with their vacation time. As for the trust issue, well, the other swappers are letting you use their home, so you just have to have faith in human nature—and the fact that most home swapping is done through an agency, so any bad eggs are going to be rooted out pretty darn quickly. Besides, this is actually an added bonus: you essentially get a free house-sitter who will water the plants, take in the mail, and feed the cat while you are gone. Resources and agencies for vacation home exchanges are listed below—both the major agencies as well as a few places where you can shop around for one-to-one swaps. However, there's a big Buyer-Beware caveat to using the direct-swap method. You may avoid the agency fees, but you also forgo the built-in safety net that all the other swappers have been vetted by that agency and can be considered trustworthy. Also note that you don't have to travel abroad for this to work. Looking to escape the Windy City for the beaches of Florida? You may be able to find some family in Ft. Lauderdale that's keen to hit the Art Institute and climb the Sears Tower. You never know. Home Exchange (800-877-8723, www.homeexchange.com ) - The outfit the characters in "The Holiday" used is one of the biggest out there, with more than 29,000 listings worldwide, including 2,150 in Italy—among which 435 in Tuscany (including 190 in Florence), 358 in Rome, 98 in Venice, and 87 in Sicily. Note that it also includes some regular rentals, not swaps. Membership: $99.95 per year; unlimited photos. Homelink (800-638-3841, www.homelink.org) - Around since 1953, with more than 13,000 listings worldwide, of which 699 are in Italy—136 in Tuscany (69 in Florence), 143 in Rome, 97 in Venice. Note: if you're using the search option on their website, it helps to search first with the Italian spelling of the city (Firenze instead of Florence, Venezia in stead of Venice, Roma instead of Rome), but then also the English spelling, since their search database is too dumb to know that those are,in fact, the same places and it categorizes them only however the homeowner spelled the name. Membership: $115 per year ($181 for two years). Intervac (800-756-4663, www.intervacus.com) - Also around since 1953, with 25,000+ members worldwide and a focus on Europe. There are 206 members in Italy. Membership: $99.99 per year (10% discount for buying two years). The Invented City (415-846-7588, www.invented-city.com) - Web-only; 2,819 listings, of which 87 are in Italy. Membership: $60 ($75 for two years, $90 for three years). International Home Exchange Network (386-238-3633, www.homexchange.com) - Tiny agency—about 3,000 listings, with just 35 in Italy—but with a big bonus. Even non-members can send an email to any property, so you can just contact a member privately and set something up. The membership fee is required only to list your own home: $39.95. Craigslist.org (www.craigslist.org)- House exchange proposals are often listed in the classifieds section of newspapers (though this usually applies only to big cities). Or, you can always use the post-modern version, the virtual classifieds of Craig's List, which also lists home swaps in its "housing" section. Be sure to check out the Craigslist not only for your hometown, but also for the places you'd like to visit, because lots of folks post exchange offers for, say, their Rome apartment on the Rome Craigslist. For example, when I updated this page I peeked at the New York and Rome Craigslists. Just among that day's listings, on the New York page there was someone with an apartment in Bologna looking to swap for one in Manhattan, and on the Rome page (under "scambio case") there was someone desperate to trade their Rome flat for a place in Miami (the previous day had a plea from someone with a two-bedroom in Rome looking to swap for L.A.). Happy hunting.